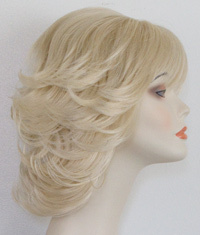 Short layered flip with bangs and a small bouf in the back crown. 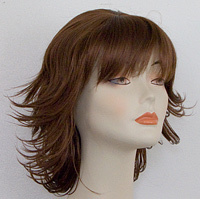 Stylists note: This wig has fuzzy hair at the base of the front bangs of the wig to help them keep their body. The bouf is on the back crown and has a small amount of fuzz hair underneath it, so you can't make it be completely flat. 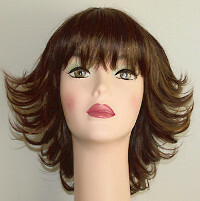 With a coin top (a plastic scalp, for those not in the know) that the hair radiates from right behind the bangs. Cosplay uses: Seras Victoria from Hellsing. Nepeta from Homestuck. 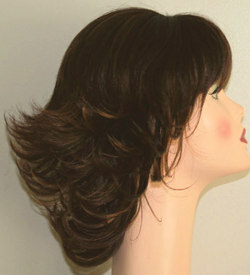 Do you need a wig for your cosplay that is flipped in the back with straight bangs? This wig may be the perfect match. (no swatch available) 2T33H27 (overall effect is brown with a lot of auburn, highlighted with a brassy blonde.